An ex-works factory portrait of D5233, just prior to entering traffic. The twenty year seven month career of D5233/25083 saw allocations to the London Midland, Scottish & Eastern Regions. 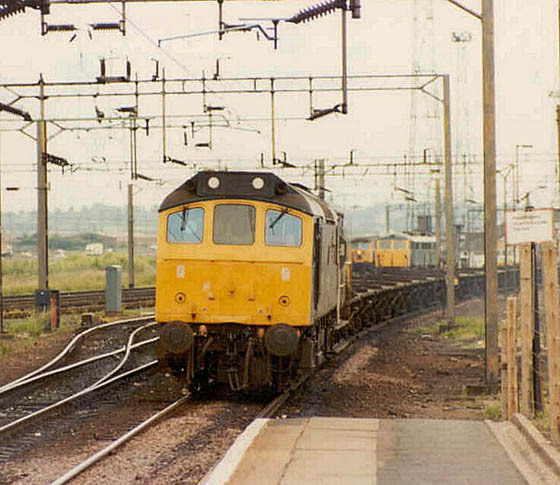 It would be one of several Class 25s allocated to Saltley for crew training and would be one of a handful of Class 25s allocated to Inverness. January 1964 to Derby (16C). December 1980 to Springs Branch. 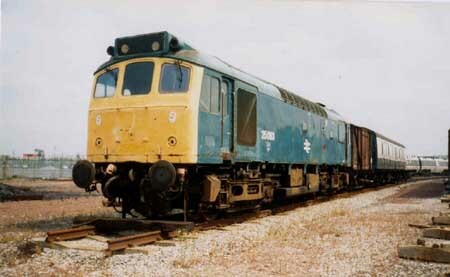 25083 was the 220th Class 25 withdrawn, the only Class 25 retired during July 1984. Basford Hall: March 1994 - ?? 1996. Crewe Carriage shed: ?? 1996 - October 2000. Caledonian Railway, Brechin: October 2000. Noted Glasgow Works March 1976. Noted Glasgow Works November 1979 - January 1980 (Collision & Intermediate repairs). D5233 was constructed at Derby during the last quarter of 1963, being released to traffic during late December to Toton (16A). 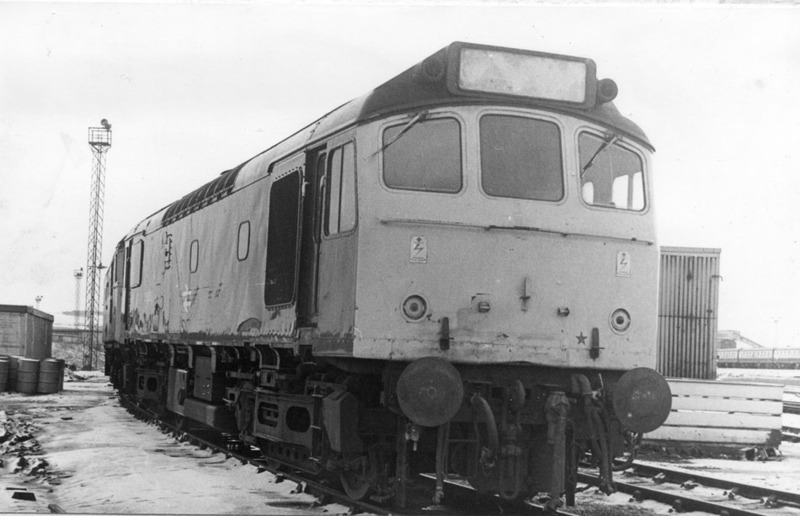 This locomotive was the first to be delivered featuring the re-styled bodywork and two-tone green livery similar to that carried by the Brush Type 4s (Class 47s). The redesign principally affected two areas; the cab and the location of the air intakes. 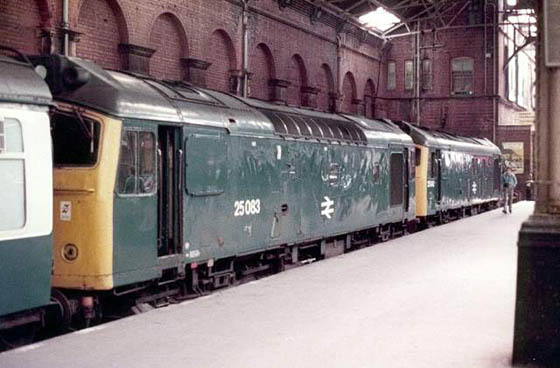 The gangway doors fitted to the earlier examples were rarely used, their presence certainly added to the complaints of noise and draughts in the cabs. The repositioning of the air filters to the cantrail was the result of a comparison carried out at Inverness between a batch of Derby built Type 2s and a batch of BRCW Type 2s, the tests targetting the air quality within the engine room. 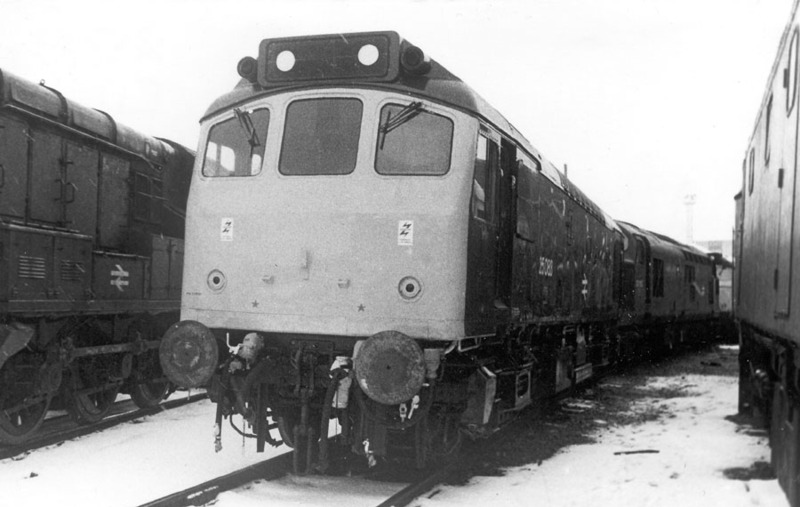 One unique feature of D5233 and the following four machines was their being equipped with steam heating equipment, all the following Class 25s would be without boilers. 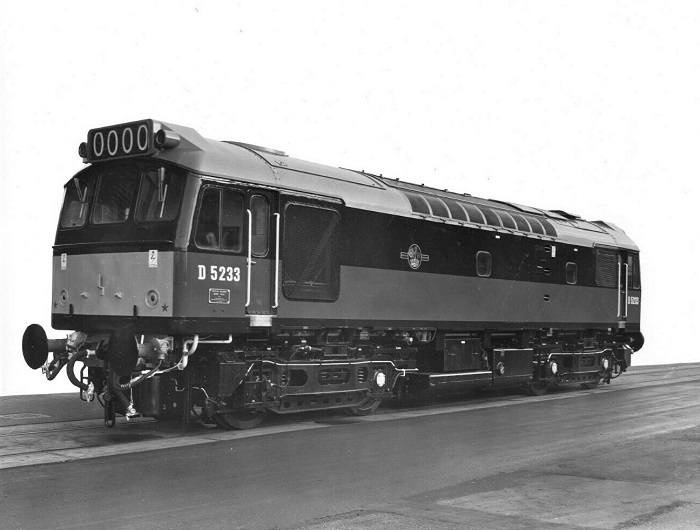 D5233 was sent out on its test run to Corby on December 6th 1963. It was not the first of the batch D5233 - D5237 released to traffic, D5234 entered traffic during the week of December 14th 1963, the others followed a week later. Cab front detail of a brand new D5233. D5233 was transferred to Derby (16C) during January, it was then sent on to Saltley (2E) during April. At this time much of the freight on the Derby - Birmingham line was still steam hauled, these transfers would allow for further driver training on the new diesels over this route and also the Birmingham - Leicester line. On January 3rd D5233 worked the 13.10 Chinley - Derby. On March 24th the 20.05 Luton - Bathgate car carrier, normally a Type 4 diagram found D7508 & D5233 working the trip throughout, returning south the next day on the 06.40 Millerhill - Carlisle freight. On June 16th 5233 & 5226 made a rare appearance working the 17.57 St Pancras - Nottingham. 5233 & 7557 were noted on a Derby - Skegness? service on June 30th hauling the infamous Etches Park maroon set. At the end of the summer season 5233 moved to Haymarket in September, then immediately moved to Eastfield. The stay here was short, by October 5233 had moved south to Tinsley, where it would spend the next eighteen months. 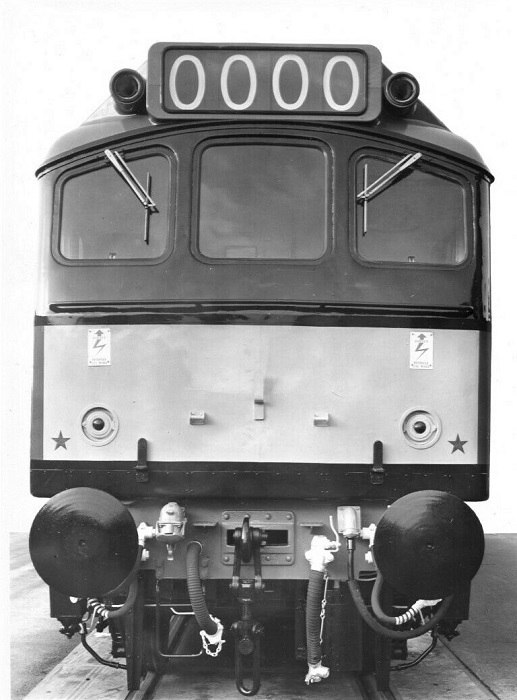 Although these Type 2s were oddities in terms of their bodystyling & being boiler equipped, this technical difference did not affect the issuing of TOPS numbers for them, they were numbered in order with the remainder of the Class. 25083 moved to Bescot during March. On March 29th a Bletchley - Lowestoft excursion arrived at Norwich behind 25065 & 25083. The new summer season began on Saturday May 24th with the Walsall - Yarmouth in the hands of 25083 & 25102. Three days later this pair were noted arriving at Skegness with a service from ? Two weeks later 25083 & 25253 visited Yarmouth twice over the weekend of June 7/8th arriving on Saturday with the regular service from Walsall, the next day bringing in a special from Burton on Trent. During the summer 25083 was transfered to Eastfield in July, it would spend the next five years allocated to various Scottish Region depots. On March 23rd 27015 & 25083 worked the 06.55 Mallaig - Glasgow. On April 14th 25083 & 24113 were hauling the Carstairs - Perth newspaper train, at Dunblane they were required to assist a failed 47550 on the 20.50 Euston - Inverness, how far the Type 2's worked is not recorded. During June 25083 was allocated to the Highland capital of Inverness, this apparently didn't stop its wanderings as it was noted at Stranraer on June 26th. On a visit south of the border (possibly on one of the pipe trains) 25079 & 25083 were borrowed by Derby on September 18th to work the 11.58 (1Z52) football special to Norwich! During May 25083 was transferred to Eastfield, in December it moved to Haymarket. May 6th was the day of the Scottish Cup Final between Glasgow Rangers & Aberdeen at Hampden Park, with five specials scheduled. The 09.30am left behind 25072 & 25087, the 10.00 had 25227 & 25033 whilst the other three featured 40167, 40063 & 40159. Late on the evening of August 8th 25238 & 25083 were noted on southbound vans at Edinburgh. On the afternoon of August 15th 25083 was noted at Dundee shed, it would later work the 16.38 Dundee - Glasgow. Photograph courtesy A Forster 25083 stands at Millerhill on December 29th 1978. Railtour duty befell 25002 & 25083 on June 23rd, handling the Edinburgh - Perth leg of an SRPS excursion to Kyle of Lochalsh. On October 22nd, the 2L31 08.44 Glasgow - Dundee service in the hands of an ailing 25083 hauling five coaches had an eventful journey as far as Invergowrie. On boarding the locomotive at Eastfield the crew found the boiler inoperative and no sign of the locomotive's repair book. A new book was obtained and the boiler made operational prior to backing down to Queen Street. An on time departure was followed by two losses of power on the stiff climb to Cowlairs, closing the throttle and then reopening it seemed to cure the problem. All remained OK until Hilton Junction when power was lost again, the train coming to a stand. An earth fault was eventually found to be the cause of the problem, power being regained after resetting and isolating the earth fault switch. At Perth a fitter confirmed the locomotive would be fit for the short run to Dundee. After the stop at Invergowrie the locomotive had difficulty in moving away from the platform. The crew stopped and examined the locomotive, discovering that the brakes appeared to be binding on the leading bogie. In the hope of making the short distance to Dundee the driver restarted the train, but was forced to stop a few hundred yards later when smoke was seen coming from the bogie. The locomotive was declared a failure and shut down. The driver climbed back into the cab whilst his assistant walked back down the train to inform the guard. The driver's assistant had reached the fourth coach from 25083 when the following 1A25 09.35 Glasgow - Aberdeen headed by 47208 ran into the rear of the stopped train. The impact threw coaches Sc14044 & Sc4440 into the Tay estuary, derailing the other three coaches behind 25083 (Sc4739, Sc4002, Sc4245). Regretably the crew on 47208 and two passengers in the Dundee train were killed, a third would die later from injuries sustained. The Class 47 and the leading coach sustained heavy damage. 25083 was driven under its own power to Dundee MPD for examination. This revealed that two internal copper conductors on one of the traction motors had burned through, causing loss of power to one bogie and leading to the remaining two motors suffering severe wheelslip and overheating when power was applied whilst trying to restart from Invergowrie. The sequence of events that led to the failure of the copper conductors and the earlier earth fault problems could not be determined. The Department of Transport report on this collision states: "the direct cause of the accident was the passing of the Longforgan Down Section signal at danger by the 09.35 Glasgow - Aberdeen express. The evidence suggests that at the material time the semaphore arm of this upper quadrant signal was raised above the horizontal by at least six degrees but by not more than ten degrees: in such a position it should have been taken to be an imperfectly exhibited signal and thus treated as at Danger, but for some reason the train driver passed the signal and continued into the occupied section". The winter of 1979/1980 found Glasgow Works giving intermediate repairs to 25083 - 25086. 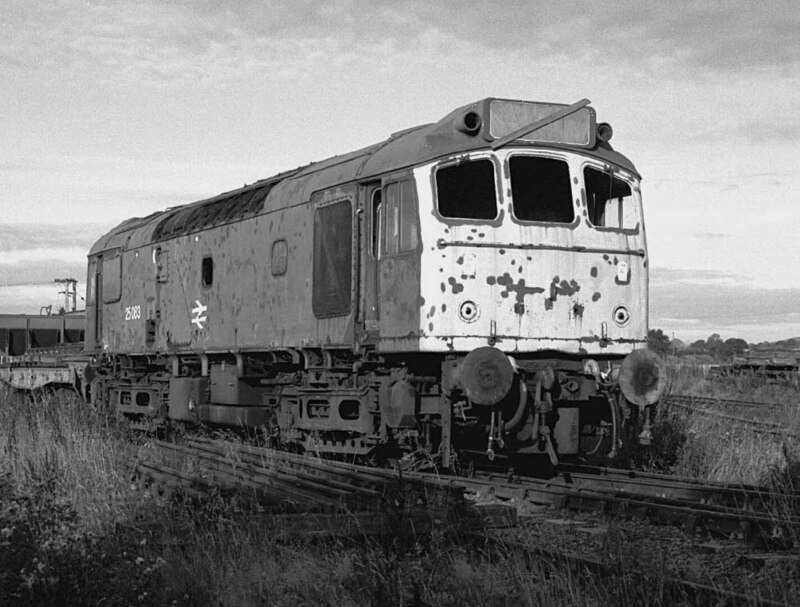 This included 25083 after its involvement in the rear-end collision detailed above - it was received for an intermediate & collision repairs, not being released until January 1980. Photograph courtesy A Forster With its paint glistening and only days out of Glasgow Works 25083 stands in the snow at Eastfield depot on February 2nd 1980. On November 5th 25083 worked a Carlisle - Tyne Yard freight. A transfer in December 1980 took 25083 away from the Scottish Region, its new home would be Springs Branch. February 4th's 16.38 Birmingham - Norwich was hauled by 25083. The 'Easter Tommy' railtour from Liverpool to Lincoln via the Woodhead route utilised 25057 & 25083 for the out and back Liverpool - Guide Bridge legs on April 21st. The railtour started out about forty five minutes late, the driver having been advised the locomotives were at Lime Street when in fact they were at Edge Hill, the driver then being sent to Edge Hill by taxi to collect the locomotives. Between May 16th & May 27th 25083 & 25062 covered over one thousand miles of passenger haulage operating a number of services out of the East Midlands (Derby, Burton & Alfreton) to Norwich (for Yarmouth) and Skegness. For the six days commencing October 19th 25083 worked at least the 12.40 Glasgow Central - Carlisle each day. In the third week of December 25083 had two short unusual workings, on 16th taking over a St Pancras - Derby working at Leicester and the next day rescuing 55021 at Wakefield Westgate whilst working a Bradford - Kings Cross service, assisting as far as Doncaster. New Year's Eve saw the end of regular Deltic working on the ECML. The 1L44 16.03 Kings Cross - York was in charge of an ailing 55017, when the train arrived at Peterborough many of its passengers looked longingly over at the 15.18 Norwich - Birmingham, its westerly journey in the capable hands of 25083. For a short while across platforms 4/5 at Peterborough the echoes of Napier's finest kept time with Sulzer's finest musical box. During January 25083's passenger workings had a distinct Western Region flavour to them. On 3rd it was noted with 45065 arriving at Bristol Temple Meads with a relief from the north, on 5th it worked the 15.00 Bristol Temple Meads - Western Super Mare, on 8th it covered the 08.00 Kidderminster - Birmingham New Street, by the 10th it had travelled far enough north to work the 19.14 Leeds - Birmingham throughout. Finally on January 24th 25083 worked the 17.38 Bristol - Taunton. Prior to midnight on January 25th 25083 failed with brake problems at Finedon Road whilst hauling two Class 317 units southwards, the units remained here until January 30th when 25153 continued their journey southwards. 25083 was noted passing through Preston light engine on May 16th. On May 15th 25083 worked a Manchester - Bangor service. The summer brought several trips over the Cambrian lines for 25083, firstly on June 12th with 25027 on the 07.40 Euston - Aberystwyth forward from Wolverhampton, coming back with the 14.00 to Shrewsbury. Before the next Cambrian trip 25083 worked June 19th's 16.17 Birmingham - Norwich as far as Peterborough. Back to the Cambrian with 25184 on August 21st's 07.38 Shrewsbury - Aberystwyth and 10.07 return to Euston as far as Wolverhampton. Lastly on September 5th a charter from Euston to Aberystwyth was taken forward from Nuneaton by 25083 & 25182, they also handled the return working. Six days later 25083 was north of the border on the 08.40 Carlisle - Glasgow passenger. The last transfer for 25083 took place in October with a move to Crewe. Shortly afterwards on October 16th it worked a roundtrip Bewdley - York charter with 25219. A newspaper printing strike in the London area during November led to 25083 having a bit of an adventure on November 27th. The strike had not affected the Manchester area printers allowing them to print additonal papers for distribution throughout the country. 25083 was summonsed to cover a Manchester - Bournemouth newspaper extra - surprisingly the Class 25 ended up working throughout to Bournemouth, presumably routed via Reading & Basingstoke. At Bournemouth 25083 went off to Branksome to refuel (see picture below) in order that it might return to Manchester with the empty vans. 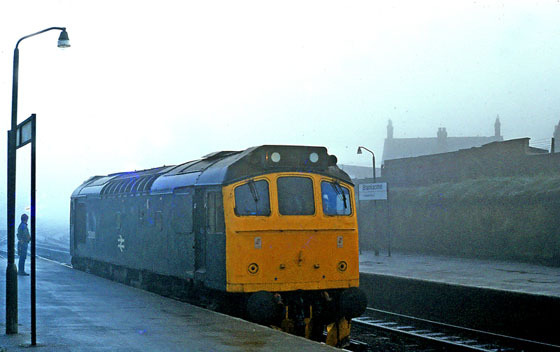 Photograph courtesy Phil the Yid c/o Mark Jamieson An early morning shot of 25083 on November 27th 1982 at Branksome - see notes above. It was a round trip over the Settle & Carlisle for 25083 on November 22nd working the 08.57 Leeds - Carlisle and 15.37 return. The first quarter's passenger workings for 25083 were a mixed bag. A failed Class 31 on a Birmingham - Norwich service on February 5th saw 25083 assist between Leicester & Peterborough. St Patrick's Day found 25083 working the 05.35 Cardiff - Crewe. On March 18th 25240 failed in the Hereford area whilst working the 15.02 Manchester - Bristol parcels, it was rescued by 25284, which left 25240 at Barrs Court Road sidings. 25240 would remain here until March 22nd when it was picked up by 25083 with a Severn Tunnel Junction - Carlisle, being deposited at Crewe for repairs. April 2nd found 25083 & 25057 in charge of a Manchester Piccadilly - Aberystwyth day excursion. The 12th found 25083 working the 19.14 Blackpool - Manchester Victoria throughout. A Euston - Bewdley charter on April 23rd utilised 25027 & 25083 from Coventry to Bewdley and then back to Birmingham New Street. On May 2nd 25083 & 25086 were in charge of a Manchester Piccadilly - Aberystwyth day excursion. On May 16th 25083 was noted southbound at Warrington Bank Quay with coke hoppers. During July yet another trip to Aberystwyth, this time from Derby featured 25083 & 25199. The Cambrian lines west of Shrewsbury were familiar territory to 25083, being a regular performer on the scheduled summer diesel hauled passenger workings, so noted on August 6th & 13th. 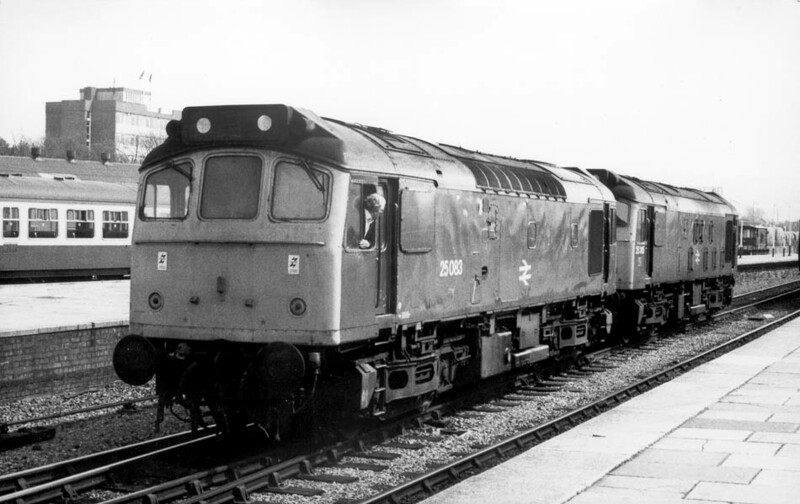 It was on one such working, the 17.15 Aberystwyth - Shrewsbury on August 6th, with 25032 when the multiple unit working capability failed, requiring both locomotives to be manned. Valiant efforts to get the m.u. to work proved ineffective. The last passenger working in 1983 for 25083 was October 10th's return working of a Blackpool - Birmingham excursion, between Preston & Blackpool. 25083 would be withdrawn during 1984, however before that event it covered a wide variety of lines on its final passenger workings, both scheduled services and charter work. On January 17th 25083 worked the 07.16 Manchester Victoria - York, normally the province of a Type 4. Photograph courtesy Nick Ross Its April 14th 1984 and 25042 & 25083 rest on the stops at Marylebone after bringing in F&W's Capital City Transfer (see note below). April was a very busy time for 25083's passenger haulage. It started off by filling in for the diagrammed Class 31 on April 5th, 25083 worked the 16.35 Leeds - Sheffield. A week later on April 11th 25083 covered the 10.03 Crewe - Cardiff throughout. A railtour from the West Country on April 14th (F&W's 'Capital City Transfer') was taken over by 25083 & 25042 at Coventry, running south through Rugby, Bletchley flyover, Claydon LNE Junction, Aylesbury, Amersham and into Marylebone. On April 21st a Manchester Piccadilly - Aberystwyth was taken over by 25083 & 25245 at Wolverhampton for the run to the coast and back. The next day the same pair were used on a Coventry - Scarborough excursion as far as Birmingham New Street, replaced here by 56053. However all was not lost as the pair were quickly used to take over a Leamington - Blackpool North excursion, it being a Sunday engineering works dictated the use of diesels rather than electrics on the WCML. They worked the return journey throughout giving the passengers some spirited running on the WCML. And finally on April 23rd 25083 & 25245 handled an excursion between Shrewsbury (ex-Derby) and Llanelli, via the Central Wales line, 47140 took over for the final miles into Tenby. After refuelling at Landore the Class 25s rejoined the train at Llanelli returning home via Cardiff and Birmingham, 37297 assisting up Lickey since the Type 2s were not pulling too well. Over this three day weekend this pair of Type 2s clocked up almost 800 miles of passenger haulage! Photograph collection of webmaster On April 21st 1984 25083 & 25245 took forward a Manchester - Aberystwyth day excursion from Wolverhampton. They are seen here running round the train at its destination. July 9th saw the withdrawal of 25083 with a main generator fault, a day that also saw York Minster severely damaged by fire after being hit by lightning, one presumes these two incidents were unrelated. 25083 would outlive all its non - preserved sisters, finally reaching preservation with the Caledonian Railway group at Brechin, late in 2000 having spent over sixteen years withdrawn! Three piece miniature snowploughs fitted (at least) November 1982 - May 1983. Photograph courtesy John Powell. 25083 at the Crewe Heritage Center sometime during 1989 keeping company with a variety of rolling stock. Photograph courtesy Tony Sayer 25083 after its arrival at Brechin sometime during 2001. Many thanks to Mark Bennett for his notes on the later activities of 25083 & to Alan Baylis' "Class 25's Action '84" book. Page added September 20th 2001. Page updated April 16th 2019.